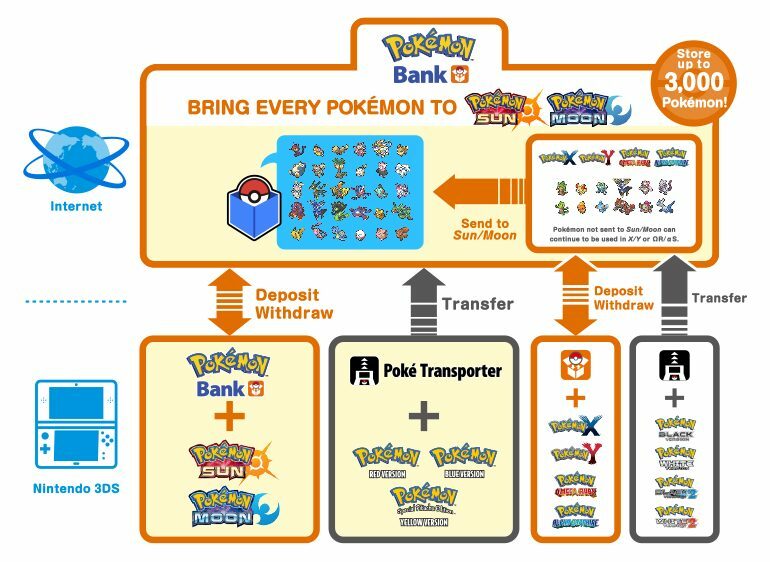 The Pokémon Bank update is now available worldwide, building on the online service that allows players to withdraw and desposit Pokémon between various games. Those that access the online service between Wednesday 25th January – 2nd October 25 Jan – Sunday 2 October 2017 can receive a special Mewnium Z. This Z-Crystal is for the Mythical Pokémon Mew, and cannot be obtained through normal gameplay. When given to a Mew that knows the move Psychic, it can use the powerful Z-Move Genesis Supernova. The update primarily adds compatibility with Pokémon Sun and Pokémon Moon, and now allows players to transfer their Pokémon from Virtual Console releases Pokémon Red, Pokémon Blue and Pokémon Yellow into the new Nintendo 3DS exclusives. Hidden Pokémon parameters from the Virtual Console titles such as Abilities, Natures, Sp. Atk and Sp. Def can be seen once they have been sent over to Pokémon Sun and Pokémon Moon. The Pokémon Company has also added two new features to Pokémon Bank as part of the update, in the Pokédex and adventure records. The Pokédex feature lets players see information about Pokémon registered in each game that has been connected to Pokémon Bank in the National Pokédex – meaning, in short, that all information for Pokémon registered from past titles is now available in one place. Whereas Adventure Records will let players look back on their adventures across the series. This will let you see the number of Pokémon caught or the number of wild Pokémon encountered, when the saved data from each game previously played is registered to Pokémon Bank. Also, when Pokémon are desposited into Pokémon Bank, players can receive Poké Miles relative to the number of Pokémon they deposit and how long they have been deposited for. These can then be received as Battle Points, which can be exchanged in Pokémon Sun and Pokémon Moon for various items.